The Japanese-made Yamaguchi WB05 'mini' dumper shifts dirt, carries tools, and even pours concrete. Just don't call it a motorised wheelbarrow. No, it's not a wheelbarrow with treads. The Yamaguchi WB05 is a proper dumper, albeit a rather small one. Who wants to push a heavy wheelbarrow around when you can walk behind a little Yamaguchi tracked dumper while effortlessly shifting loads of up to 500kg with the second smallest machine currently on offer, the WB05a. With these little beauties, even the hard jobs are enjoyable. Yamaguchis are made in Japan and imported by Advanced Machinery in Porirua near Wellington, and I travelled to the capital to try out a Yamaguchi WB05a, owned by Daniel Renshaw Drainage Contractor Ltd. The little dumper was working on a restricted site in the heart of Wellington, where space is at a premium. Pipes had been laid between two buildings where there was not even enough space to move a little 1.7-tonne digger through, and with everything installed, it was time to backfill. What would have been a labour intensive chore became a breeze thanks to the compact size of the WB05a. 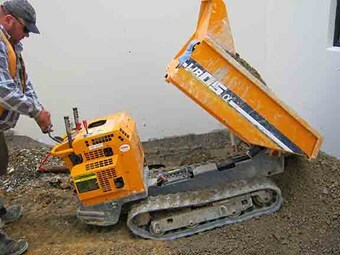 Operator Ants swears by the little dumper: "It's brilliant, we use it on a lot of sites and not just to shift dirt. It's great for pouring concrete in difficult places and we also use it to shift our gear around on-site. The little machine gets sad when people call it a motorised wheel barrow - it's a mini dumper!" jokes Ants. The original plan was to use the machine to shift some basecourse across to the trenches, so Ants loaded the Yamaguchi with a three-tonne digger and, surprisingly, it took three heaped digging buckets to satisfy the little WB05a's appetite. Releasing the parking brake, engaging the drive and I was away. First gear offers a comfortable and very controllable pace, allowing operators to precisely manoeuvre the dumper around without panic, and once in the right position, a push of the hydraulic tip lever sees the load quickly dumped out. Once the basecourse was in the trenches, I selected reverse and backed the machine out, giving the dumper an opportunity to show how easy it is to control in both directions and I was soon back for another load. Second gear gives a top speed of 4.4 kph, which is a good pace when travelling further distances. The 200mm wide rubber tracks provide a light footprint and excellent traction for climbing. The Yamaguchi WB05a is a solid, well-constructed dumper, featuring an electric-start Mitsubishi GB180, 4kW motor with pull-start back-up. Drive to the tracks is a simple but reliable set-up consisting of two slack V-belts with a tensioner controlled by the drive lever. Engaging this lever tightens the belts and transmits power to the two-speed forward/reverse gearbox, allowing for very smooth starts. A left and right hand steering brake takes care of turning the dumper, while a safety bar protrudes from the rear of the controls and is linked to the park brake. Should the operator slip or get between the dumper and a solid object, they will not get crushed as the machine will be bought to an immediate stop. The rubber tracks have spring-loaded automatic tensioners and all the track rollers are greaseable to extend their life. If bearing failure occurs in a roller, the bearings can be replaced without having to buy a new roller, helping to keep the running costs down. The body is tipped with a hydraulic ram and the dumper can be driven while tipping, thus allowing the material to be spread. The hydraulic system is a neat design, with the pump, control valve and reservoir all incorporated into one housing to keep the engine bay compact and tidy. The Yamaguchis are proving to be very reliable and strong, but the best test for any machine is to put it in a dry hire fleet and see how it survives. 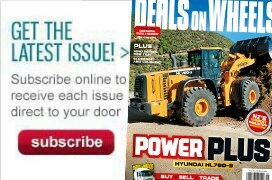 This is exactly what Andrew Wyness from Advanced Machinery has done. Along with selling a range of new models, Advanced Machinery also has a comprehensive hire fleet. Wyness says, "The Yamaguchis are really proving themselves. They are popular and we get good feedback. Several of our dumpers have been rolled and they have survived with little or no damage, usually just a bent lever or something minor." With a tare weight of only 310kg, the WB05a can be easily shifted to jobs on a ute or trailer, or even in the back of a van. The width is a mere 720mm, allowing the dumper to slip through a doorway or along a narrow path. The Departmentof Conservation are currently utilising them on their huge network of walking tracks throughout New Zealand, helping to maintain existing tracks and also build new ones. Wyness says, ";They are perfect for use in these remote locations because they are so basic to operate and maintain, and can be easily delivered by helicopters." Yamaguchi offers a range of machines, from the WB04a through to the WB18b ride-on model with three-way tipping, HST and ROPS. All are proving popular for a huge array of tasks around the country.